Punch works swiftly together with Harvest and Freckle*. 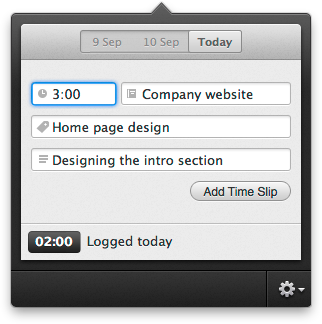 Link up your account and start adding some time slips! * Support for other services might be in the pipeline, just saying. The fastest way to enter the amount of time you worked on a task, is through shorthand time units. 30m, 2h30, 1:25 — whatever floats your boat. No-one likes to stress on correctly spelling a project or task. That's why Punch autocompletes as much as possible. It's super fast and error-free! 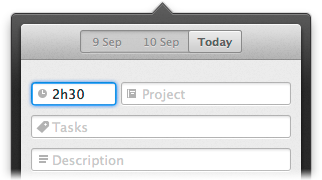 Other than adding tracking today's time, Punch allows you to quickly add time slips for yesterday and the day before. Super fast, super easy. © 2012 Punch. All rights reserved. Punch is not affiliated with Harvest or Freckle in any ways.